Eventually I'd like to do something every Friday like, local events or something but this week it's going to be a bunch of randomness! Life: I'm trying to keep my priorities in line this year and not let the little stuff get to me. We have been blessed so much and the Lord has always provided for us and protected us. So, why do I need to stress about stuff that, in the end, I know doesn't matter? For example, our Homeowner's Association and homeowners in our neighborhood are a drama-filled mess. I'm not going to bore you with all the specifics, but they recently sent a letter saying the HOA was dissolved. There are a bunch of other aggravating issues that go along with it, but the main thing that got me was that the VA (Veteran's Asssociation) will not finance a home on a dirt road without an HOA in place. Well, we live on a dirt road and in a huge military town. I feel comfortable saying that I would guess at least 90% of the homes purchased here are done through the VA; the military is that prominant here. So, basically, if there is no HOA, we are stuck in our house infinitely, which is NOT in our plans. I was getting all fired up about how screwed over we are and blah blah blah, but then I thought about if it really mattered. I mean, we have a house that we can afford and that protects us from the elements (for the most part). In reality, we aren't planning on moving anytime soon, and if some amazing opportunity presented itself, we could rent the house out. In the end, it's just a house, and it's just money. There are so many amazing things happening in our lives, like watching the kids grow and develop, why should I let things that I don't have control over and that really don't matter ruin my mood? Things happen for a reason and will play out how it's meant to. In the meantime, I'll just be patient and put my trust in Him and focus on the innumerable blessings we have received. Weekend Project: I'm really hoping to get most of my first table runner put together. I have the squares cut out, and would be happy if I just got them pieced together. Then, I have to figure out what backing to use and approach the scary part for me: the quilting part! Hopefully, I can take pictures and share my experience next week. 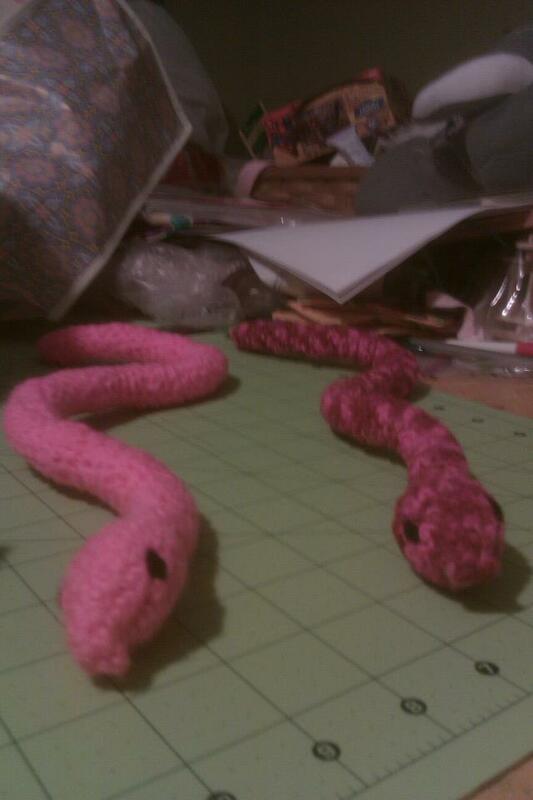 Finished Project: I am hoping to add a section to my Etsy shop with cute little crochet animals. I had a snake listed but it sold within 24 hours! That was an awesome feeling! I made ones for my boys and now have some requests to make them for family and friends. So, I'll be mixing in their orders with making ones to be listed. I'm also hoping ot get a ladybug done before Valentine's day, but we'll see! Aren't they cute?! 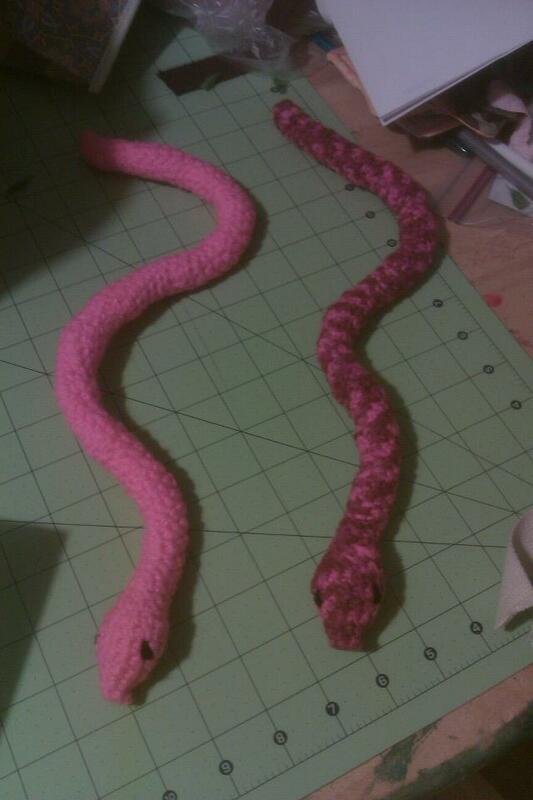 The pink one is for a niece and the variagated one will be listed in my shop. So, see that mess in the back...yeah that's on my to do list this weekend. Actually, I have to do that first so I can have room to sew! That would be a product of Christmas, getting ready for a bridal shower, and traveling. Anyway, hope everyone has a wonderful Friday and weekend! I just linked up this post to Crazy Mom Quilts, Finish it Friday! Check out her post and see what other crafters and creators are up to! Good luck with your Etsy shop! Those are very cute! !